Semantic Search. I imagine saying it five times into a mirror conjures an effect similar to horror classic Candyman. It’s all anyone in the Search world is talking about on blogs, at conferences, and in hushed whispers in the break rooms of agencies. Yes, the future is coming, and it is semantic. Some of it is already here. Let’s take advantage of it! Many posts just like this one focus solely on the how, but today I’m going to switch it up and give you the why. Google’s Hummingbird release, as documented by our own Andrew Garberson, changed the search game in a major way. Not only did (not provided) significantly alter data available to search marketers, Hummingbird signaled a major learning leap on the part of Google. No longer confined to a toddler-level reading ability wherein a term is just a term unto itself and needs endless repetition (read: keyword stuffing), it signals a shift towards a first-grade reading level by the search engines to place words in context and take educated guesses at synonyms, meanings and full language understanding. Example: “hot dog” and “hotdog” meant different things to pre-Hummingbird search, but could easily be synonyms to the current technology. It’s clear that the concept of a singular keyword is dying if not dead. So what replaces the notion of a singular keyword? Semantics, semiotics and entities of course. Famed futurist (and consumer of 150 vitamins per day in an earnest effort to exceed the normal human lifespan) Ray Kurzweil’s semi-secretive project at Google is focused on creating an artificial intelligence with machine learning capabilities that will rival the human mind. I like to imagine this as a supercapable version of Googlebot, who I’ve dubbed Our Robot Friend (or ORF). If you were to undertake this task, where would you start? Semiotics, the study of signs and symbols, provides us a wonderful framework with which to start. It has been applied to language development in the human brain as well as cultural topics. Isla Maketti wrote a tremendous intro to Semiotics for Search on Moz and I won’t retread. It asks great questions like “Does your website look like it represents your business?”. Please read it and come back. Ok, thanks. What does that sound like? ORF wants meaning! Interesting! I know, I know, already you are thinking “I want to make money and be a marketer, I didn’t go to school for this philosophy stuff!” Hang in there. Syntactics – The stuff. Form. 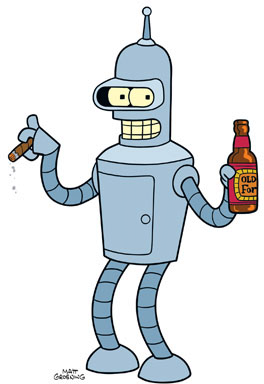 The one most relevant to us, and to Our Robot Friend scraping our webpages right now is the first; Semantics. Symbols & Meanings. 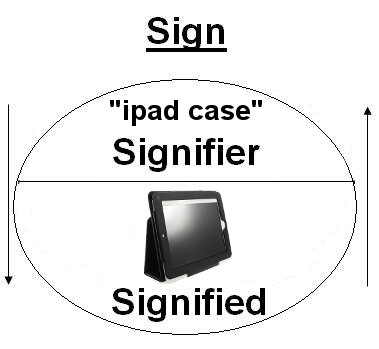 Popularized by Saussure, the simplest version of Semiotics (dyadic, for you nerds) tells us that a Sign is comprised of a signifier, or the name of a thing, and the signified, what that thing represents. In Shakespeare’s famous line from Romeo & Juliet: “What’s in a name? that which we call a rose, By any other name would smell as sweet,” the name “rose” doesn’t mean anything without the conveyed meaning that it represents – a thorny, green stemmed, red-petaled flower with a lovely scent. The two ideas interact with each other to create a sign. Or take the famous dadaist painting The Treachery of Images (1929) by Renee Magritte. 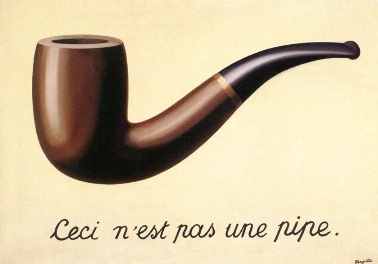 The translation of the painting’s phrase says “This is not a pipe”. He was demonstrating the exact notion of signifiers (The word “pipe”) and their representations (A picture of a pipe). Now to the part where this relates to your website! Say you sell iPad accessories. 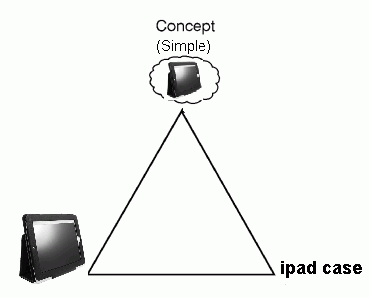 “iPad case” is your signifier, or keyword in search marketing speak. We’ve abused the signifier to the utmost over the years, stuffing it onto pages, calculating its density with text tools, jamming it into title tags, in part because we were speaking to robot who read at a 3-year-old level. Take a look at the graphic above. WE’VE ONLY BEEN TELLING OUR ROBOT FRIEND HALF THE STORY! Sorry to yell, linguistics gets me all excited. As search marketers we’ve communicated only enough info needed to get by. Find a tactic, exhaust it, repeat. But what about the signified? Our robot friend has evolved to figure out that there’s a price tag on the page, and a product photo (sometimes), so it loosely gets what’s going on with little help from us. Is that enough to create a real sign? Yeah, more or less. But wait! Now we are communicating a concept, albeit a simple one. This pleases Our Robot Friend! A guy named Pierce came along and suggested that this isn’t enough. He wanted another piece, (a triadic relationship) that would convey the thing, some representation of the thing, and an idea who and what it was for. In Search, we have this. Enter: Schema! Look at that rich concept! I love it. Now we are really communicating to Our Robot Friend. It gets us. We are creating real meaning now! Take a look at the link, find your tags and send them to your devs. Check out this post for tips on using Schema for B2B websites. Measure implementation with Google Tag Manager (See Sayf Sharif’s post on tracking any on-page content in GTM or Mike Arnesen’s post of Schema & GTM). Don’t do it because it’s a tactic , do it because it helps fill in the blanks for Our Robot Friend. For ten years we have been doers, focused on tactics and finding cracks in the system to effectively game the system and get ahead. From now on we must be facilitators, providing clean, concise information to the search engine crawlers. 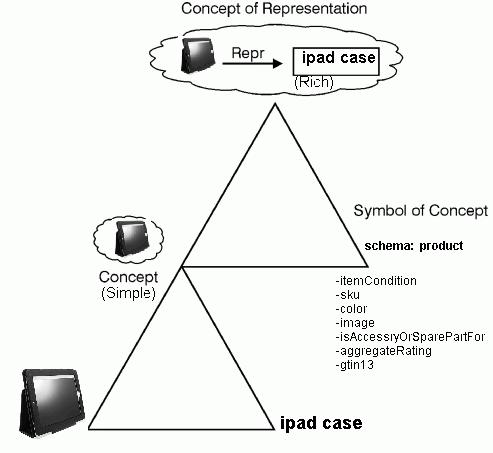 Schema is one way to accomplish this. There will be others in the semantic revolution, like entities (which I’ll address in a future post). Now you are ready to join the semantic revolution. It really makes me wonder: after digital agencies, startups and tech companies have hired alllllll the data engineers in the world, and they have gathered alllll the data, will there finally be a place in technology for the linguist, the humanist and the philosopher to tell businesses what it all means? It makes me hopeful that my liberal arts degree will finally be useful in my field. I had planned to start an intensive vitamin regimen to make sure I lived to see that day, but it may be closer than we all thought.